Did you know that you can offer a friend a Blue Cat Audio plug-in for Christmas? Just add the plug-ins you want to offer to your shopping cart, and then select the appropriate shipping information: the licenses will be sent to your friend, and the invoice will be sent to you. It's as simple as that! We are happy to announce our winter special offers to celebrate the end of the year: save 20% on any of our audio plugins and bundles. Download the demos and try them out! Just beware: the offer is valid only until December 31st, so don't miss it! Existing customers (prior to this announcement) are granted 40% discount: check your emails! Please welcome our new website! The navigation has been completely redesigned, and a couple of new features have been added to help you find what you are looking for. We hope that you will like it! We are happy to announce that most our plug-ins are now available in AVID Audio Extensions format (AAX), for an optimal Pro Tools 10 experience! Check out our AAX Versions page for more information and downloads! And if you are at the AES Show, be sure to stop at the AVID booth and check their demo of our plug-ins! Blue Cat's MB Dynamix Pack has been granted a "performance award" and was rated 8/10 by Computer Music Magazine: "A super-flexible, great-sounding plug-in combo for the more technically inclined." is their verdict in the october issue. Longer quotes are also available on our products pages or in the Reviews section. If you still haven't tried these plug-ins, check them out! The 131st AES convention will take place in NYC from October 20th to 23rd. Blue Cat Audio will not have an official booth at the exhibition, but we would be glad to meet you there! So if you intend to be on site during the convention and you want to meet, please contact us! 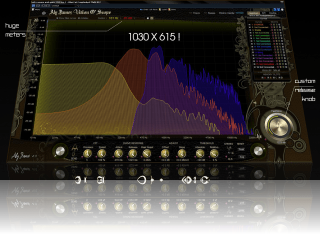 A new skin set for the free Blue Cat's Gain Suite plug-ins is available for download. In addition to a new look, it also brings better precision, using long faders with down to .01 dB steps. Check out our new "Long Faders" skin! Hayate-Yagami strikes again: a new skin is available for download. This time, his "Precise Button" skin has been crafted for Blue Cat's Parametr'EQ. We are happy to announce the update of our website, with a new integrated shopping experience. Check out the new cart, and tell us what you think! "In short, with these useful, inventive, and innovative plug-ins offering completely new features, the publisher has pulled it off perfectly. Congrats." 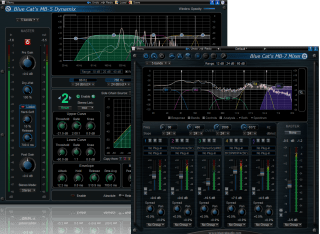 Check out Audiofanzine's review (French), or the quotes available on Blue Cat's Analysis Pack page: the bundle has been granted the "Audiofanzine 2011 Innovation Award"
If you still do not own these plug-ins, check them out! Blue Cat's MB Dynamix Pack has just been updated: this upgrade introduces a new plug-in (dual channel version for the MB-7 Mixer) as well as several enhancements for both plug-ins, bringing better performance and precision to streamlined multiband side chaining capabilities. The upgrade is free for existing customers. If you still haven't tried these plug-ins, check them out! A new skin for Blue Cat's DP Meter Pro is available for download, thanks to Hayate-Yagami. Check out his "Precise Gauge" skin that brings longer history and precise meters. 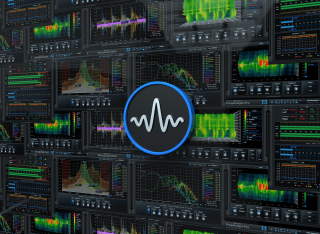 New versions of our award winning audio analysis plug-ins are now available: this update mainly brings output data refresh rate customization to improve MIDI or automation output for smoother side chaining, new trigger mode for the oscilloscope, note display for spectrum analyzers, pan law selection for stereoscopes, performance improvements on Mac and much more... Details are available for each plug-in on the products pages. The upgrade is free for existing customers and can be downloaded from the same location as the previous version. If you do not own these plug-ins yet, demo versions in DirectX, VST, RTAS and Audio Unit formats are available for download. Check them out! "With Blue Cat Audio’s innovative MIDI side-chaining system, the sky’s the limit": that's the way Sound On Sound magazine starts its review of Blue Cat's MB Dynamix Pack, published in the July issue. You can read the full review online, or in this month's issue. Quotes are also available on our products pages or in the Reviews section. 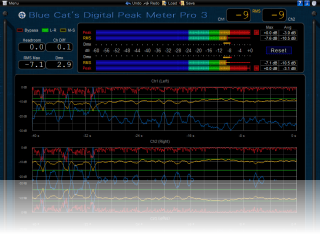 Many thanks to Aly James for his wonderful skin for Blue Cat's FreqAnalyst Multi. Check it out: it's a large skin with many custom features and an incredible design. We are happy to announce a partnership with Feeltune, the French company behind the Rhizome: many of our plug-ins are now shipped with this "VST groove station". If you don't know this incredible machine yet, check it out! If you own a Rhizome, check our other plug-ins and try them out! 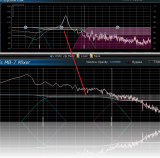 Blue Cat's FreqAnalyst Multi and Blue Cat's StereoScope Multi have been updated: this new version mainly brings the ability to save difference curves in order to perform comparisons between response curves. This new tutorial demonstrates this capability and explains you how to imitate the sound of a guitar amp cabinet with a simple EQ. The upgrade is free for existing customers, and if you are not yet among them, check out the demo! 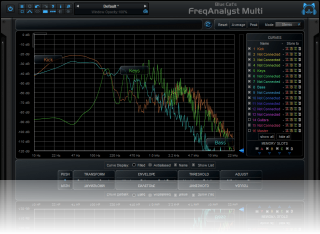 Check out our latest tutorial: it explains how to use the latest version of Blue Cat's FreqAnalyst Multi in order to match the spectral response curve of third party hardware or software with an EQ. We have (at last!) updated the documentation of our skinning language which lets you customize the user interface of our plug-ins. This new 1.7 documentation unveils many previously undocumented features, such as 3D support, build time loop structures, animations... That's a great deal of new powers in your hands! Check it out in the Skins section and send us your creations! 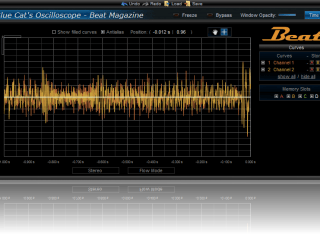 We are happy to announce the release of Blue Cat's Oscilloscope BeatM, a real time waveform analyzer plug-in, exclusively distributed with Beat Magazine (Germany). It is available on this month's DVD. You can register and get your serial number here. It is necessary to activate the plug-in. If you already have the magazine and you are looking for additional and complimentary analysis tools, check out our other audio analysis plugins! A new free skin for Blue Cat's MB-7 Mixer is available for download: this skin transforms the plug-in into a very simple single band utility that lets you adjust the gain, stereo spread and panning of a track. It also includes a mono switch, level meters and multiple instances grouping options. The skin works for both the mono and stereo versions of the plug-in. 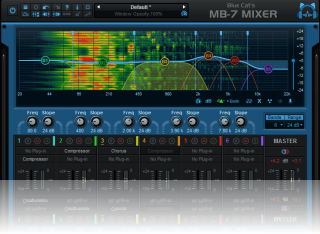 We are happy to announce the release of a brand new plug-in, Blue Cat's MB-7 Mixer. Blue Cat's MB-7 Mixer multiband mixing console plug-in is a unique plug-in that splits the signal into several frequency bands and let you mix them as if they were separate tracks. It includes many features that can be found on a mixing console, such as grouping, stereo panning, stereo spread control. It also offers unique connectivity capabilities with our existing tools such as Blue Cat's MB-5 Dynamix, that can be used for side chain multiband dynamics effects, as shown in this tutorial. 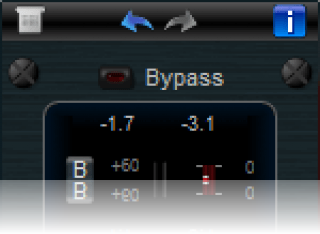 It is available as a single plug-in or within the new Blue Cat's MB Dynamix Pack. Several other bundles have also been refreshed for the occasion and include this new plug-in: check out the new Blue Cat's Energy Pack and Blue Cat's All Plugins Pack. This new plug-in and its related bundles are available at a special introduction price (up to 22% off) until the end of the month. Existing Blue Cat Audio customers have access to special customer offers with larger discounts (sent by email). Check out the demos! A new tutorial to setup Blue Cat's MB-7 Mixer and MB-5 Dynamix for multiband sidechain compression, expansion, gating (and dynamics processing in general) is available. Check it out, it's free: Multiband Side Chain Dynamics. We have just published a new tutorial which explains how to use Sonar's grouping capabilities in order to connect plug-ins and create side chain effects. Check it out and experiment by yourself! 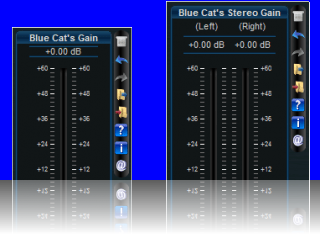 Many thanks to satYatunes who has sent us a set of beautiful new free skins for Blue Cat's Stereo Chorus. You have the choice between a "Black Beauty" and a "Metal Beauty" to create the sounds of your dreams. The two skins are available for download for free here! We have just released an update for all our audio plug-ins: it fixes an issue with keyboard focus being stolen by the plug-ins in Pro Tools and several other host applications (mainly on Mac). For several analysis plug-ins, it also makes the visibility of controls persistent. For plug-ins that did not support it already, this update also brings 64-bit VST support on Mac as well as SSE 2 optimizations for better performance. As usual, the upgrade is free for existing customers and can be downloaded from the same location as the previous version (upgrade emails are on their way). If you do not own all our plug-ins yet, you can check the demo versions or download the free plug-ins here. Looking for older news? Please consult the 2010 News page.